The State of California recently approved the largest annual budget in its history. But, it’s not enough. Therefore, capture recent economic upturns in the regular budget, thus paying for the ever increasing cost of pension contributions. Then implore the taxpayers to accept a separate transportation tax, a "pothole tax," and you’ve covered the pension costs using smoke and mirrors. Brilliant. The OC Register‘s Commentary section covers the joys of public employee defined pension plans when equity markets take large swings. I addressed this topic six years ago on the same editorial pages in an UPDATE, see MOORLACH UPDATE — Pension Boosts are a Bad Bargain September 16, 2009 John Moorlach. The OC Register‘s piece is the first one below and addresses the recent phenomenon of "pothole taxes" springing up around the state and is now being deliberated in Sacramento. We should not pay a pothole tax when the California Department of Transportation has some of the nation’s worst performance metrics (see MOORLACH UPDATE — Cost of Engineers — August 26, 2015 John Moorlach). The second piece is from the Murrieta Patch, which recaps the conclusion of another exciting week with Caltrans (see MOORLACH UPDATE — Going Golfing — August 29, 2015 John Moorlach). Reality check: Markets not only go up – they also go down. That’s something all investors realized, again, in the past 10 days as the Dow Jones Industrial Average first crashed more than 1,300 points over three sessions, then recovered a little at the end of last week. These investors included not just individuals, private retirement funds and mutual funds, but taxpayers who are on the hook for public pension funds heavily invested in stocks – especially in California. This year the state treasury was flush with $10 billion in unanticipated revenue. Yet the Legislature even now is meeting for two extraordinary sessions, called by Gov. Jerry Brown, to increase taxes to pave roads and improve medical programs. But the sessions really are just to cover up the need for spending more on pensions, Sen. John ‍Moorlach, R-Costa Mesa, told me; he’s also a former Orange County supervisor who wrangled for eight years over pensions with the Ornage County Employees Association. “I’ve been saying on the floor of the Senate, this is not a tax for roads or medical care,” he said. “You can’t call a pothole tax a pothole tax and use it for pensions.” In government, all money is fungible; it can be shifted around by flipping spreadsheet numbers. Former San Diego Councilman Carl DeMaio, who helped pass pension reform in that city in 2012, said taxpayers get slammed twice during stock downturns. “Not only will you be hit in your own portfolio, you’ll have to write a check for the public employee down the street,” he said. The cost of taxation has to go up – or services have to be cut. He said what’s needed is pension reform such as the initiative for which he’s gathering signatures to put on the November 2016 ballot. A Republican, DeMaio is teaming with former San Jose Mayor Chuck Reed, a Democrat who passed pension reform in his city (until courts and the City Council shredded the voters’ decision). The initiative is circulating petitions, but already is facing a buzz saw of opposition from public employee unions. “We need to reform pension benefits so taxpayers are not responsible,” he urged. “Public employees should be responsible.” Among other reforms, his initiative would move the current system toward making public employees half responsible for their own losses, with the taxpayers still on the hook for the other half. It’s a start. Ultimately, we need to look to the long term, David Crane told me; a Democrat and one of the state’s top public pension experts, he teaches finance at Stanford University. “What matters is long-term growth and decline, not short-term,” he said. And the long term looks dismal. He said that, to keep its unfunded liabilities from growing, the California Public Employees’ Retirement System must gain a giant 9.7 percent a year for the foreseeable future. Yet its goal is 7.5 percent. 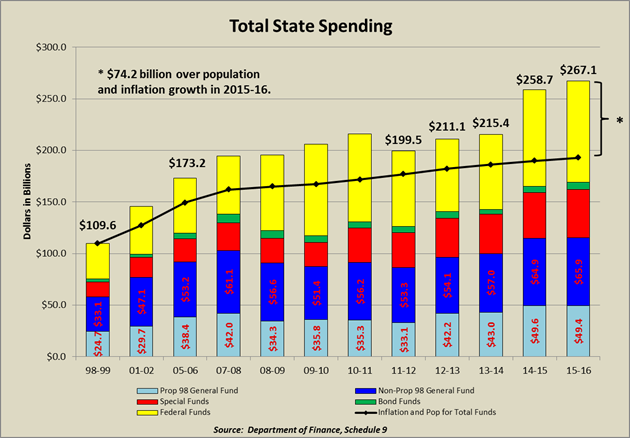 And for fiscal year 2014-15, which ended June 30, it grew by just 2.4 percent. How big are those unfunded liabilities? Last November, Controller John Chiang (now state treasurer) issued a report. It found CalPERS’ unfunded liabilities had mushroomed to $198.2 billion in 2013 from just $6.3 billion in 2003. The latter year was just the beginning of the pensionspiking the myopic Legislature passed in 1999, but which has now caught up with us. The spiking of 1999 came during the dot-com boom, when the new tech companies, such as Google, supposedly had changed the structure of the economy to prevent future recessions. Reality struck with the dot-com bust of 2000-01. Then with the Great Recession of 2007-09. Now with the August Angst of 2015. Sen. John Moorlach, R-Costa Mesa, denounced the golf function, saying it was another example of Caltrans wasting taxpayer’s money. The director of Caltrans’ Inland Empire office and other higher-ups within the agency on Friday dropped plans to participate in a charity golf tournament in the face of a lawmaker’s criticism that they shouldn’t be spending a workday on the fairway. The California Transportation Foundation Charity SoCal Golf Tournament is set for Monday at the Dove Canyon Country Club in Orange County. Those slated to attend included Bulinski, Caltrans Director Malcolm Dougherty and Caltrans District 12 Director Ryan Chamberlain — all of whom have since canceled their appearances. Sen. John Moorlach, R-Costa Mesa, denounced the golf function, issuing a statement Friday morning calling the outing another example of Caltrans employees wasting time on the taxpayers’ dime. He called for the transportation agency’s officials to withdraw from the event, citing a report released Thursday by the California State Auditor, which found that from August 2012 to March 2014, a Caltrans engineer spent 55 working days playing golf — and his timesheets were all approved. Bulinski, a civil engineer who has worked for the California Department of Transportation over two decades, declined to comment on the senator’s accusations. “All I can say is this is unfortunate. The timing is unfortunate,” Bulinski told City News Service. Moorlach, a certified public accountant, has spent the past week issuing statements on the need for reform at Caltrans. He said the auditor’s findings that 62 percent of vetted projects ended up over-budget, accompanied by a report from the state Legislative Analyst’s Office that Caltrans is believed to be over-staffed by 3,300 employees — at an average annual cost of $143,000 per employee — “screams” for attention. According to the lawmaker, justification for overhauling the transportation agency is all the more apparent as the governor and others seek tax hikes to pay for statewide infrastructure overhauls.